And so it begins: ExpressLanes — Los Angeles County's first foray into congestion pricing — open Saturday night on 110 freeway! The first freeway in Los Angeles County opened in 1940 (the Pasadena Freeway), the first carpool lane in 1973 (the El Monte Busway) and Saturday at 10:02:26 p.m. the first HOT lanes debuted as part of the new ExpressLanes on the 110 freeway between Adams Boulevard and 182nd Street. At 10:02:26pm HOT lanes on the 110 were delivered to LA County. Obviously traffic is fairly light on a Saturday night but the ExpressLanes may get a better workout tomorrow when the Clippers play at Staples Center at 12:30 p.m. followed by a Lakers game at 6:30 p.m. The first big rush hour test will begin early Monday morning. The carpool lanes on the 110 remain free for carpoolers, vanpools and motorcycles. The big difference between now and life before 10:02:26 p.m. tonight is that single motorists can use the lanes in exchange for a toll. The toll will change depending on the amount of traffic; when there’s plenty of extra space in the carpool lanes, tolls will be less expensive. When there’s less space due to heavier traffic, the tolls will be pricier — the idea being to limit the number of cars so that the carpools are always flowing at a minimum of 45 mph. Tolls for single motorists will vary between 25 cents per mile and $1.40 per mile. If you enter the lanes, the price of tolls is locked you pay is locked into the amount per mile at the time you entered the lanes. Another key difference between the new ExpressLanes and days of yore is that ALL VEHICLES, EVEN CARPOOLERS, ARE REQUIRED TO HAVE A FASTRAK TRANSPONDER IN ORDER TO USE THE LANES. I put that in bold caps because it’s the question we’ve been getting time and again. All the information you need about getting a FasTrak transponder can be found here. Also, here’s a recent post on The Source succinctly explaining some of the basics about the ExpressLanes. And here’s the news release posted yesterday on the new lanes. Finally, a short editorial message from yours truly: The ExpressLanes are a one-year experiment funded largely by our friends in Washington D.C. The reason that Metro is trying HOT lanes — which are used in other areas around the country — is that the status quo on area freeways wasn’t all that great. It’s time to try another way to manage the freeways to see if there’s a way to improve traffic flows and raise some revenues that will be pumped back into much-needed traffic. If you have questions, fire away and we’ll try to promptly answer them! Since Monday is a holiday (Veterans Day) for many people, I suspect that the first real test is likely to come Tuesday. Good point. Traffic is light in much of the region today due to the holiday. It was certainly be heavier tomorrow. Do mta silver line buses use these lanes as well? Yes, the Silver Line uses these lanes on the 110 freeway and will also be using the ExpressLanes on the 10 freeway when they open next year between Alameda Street in downtown L.A. and the 605 freeway. I am a bit suprised about this new sudden change to the freeways but many people might not be aware of the changes in the freeways what happens if they enter the carpool/express lanes without the fastrak box, how much will the people fined? $50? $100? I hope you can answer my question soon. thank you. The initial notice will include a $25 penalty. If the notice is not paid within 30 days, an additional delinquent penalty of $30 will be assessed. If I buy a transponder, and the one year experiment is cancelled, will I be able to be refunded for the transponder? You’re not actually buying a transponder — rather, you’re putting a deposit down on it. So when you return the transponder, you get the deposit back. Any word on that briefly-mentioned livechat reference to the free toll credits / TAP credit for riding the silver line? It’s not on the website and the only place I’ve seen it mentioned was that live chat article. Interested to learn more! Metro is closed for Veteran’s Day. So if you can hang tight a day I’ll try to get an answer Tuesday. I keep reading different information about when the $3 a month service fee will go into place. Some have said when the 110 opens others when the 10 opens, can you clarify please. The $3 account maintenance fee won’t get into effect until after the ExpressLanes opens on the 10 freeway, which is scheduled for early 2013. As for seniors who would use the HOT lanes infrequently, why not grant a free transponder and waive the $3 monthly fee for those with a senior TAP card? Frankly, it doesn’t feel like this is working. I have been commuting on the 110 Fwy since March. My drive from downtown to Carson used to be a fast 15 minutes….now, after the inception of the Hot Lanes…it is a SLOOOOOW 25 minutes. Where are all these people coming from all of a sudden? They are certainly NOT in the HOT lanes. 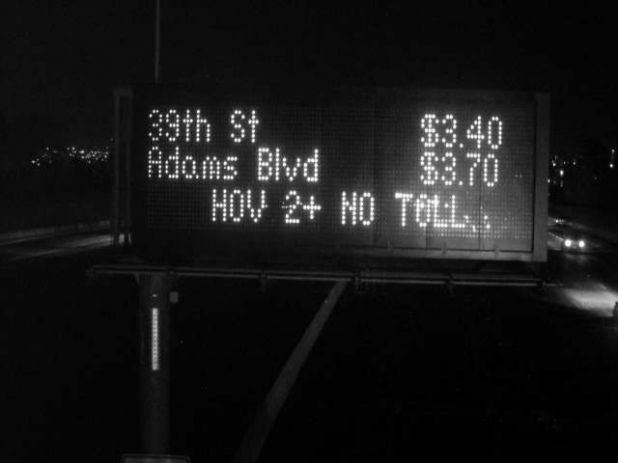 And what does “Nov 2+ No Toll” really mean? The ExpressLanes are free for carpoolers but everyone must have a transponder in their car in order to use them. Please see this website to learn more about getting a transponder. I am Overseas and had my GPS on which told me to take the carpool south on the 110 on saturday 16th november. I didnt know we needed a transponder. I think this system is so confusing for Overseas visitors who like me know about the fastrak lanes but when they say carpools can still use it and not mention anything about a transponder needed this is wrong. Surely there must be a bit of leway due to this? Who do we contact about fines?